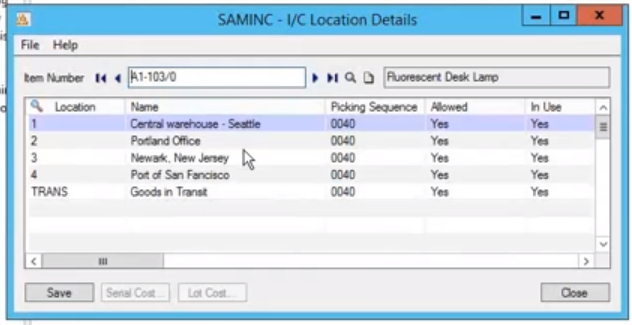 Are you currently using Sage 300 for your manufacturing operations? Do a better job tracking the real-time status of your production runs? Account for labor and overhead costs on top of material costs? Access the performance of your production units? Better plan for material requirements and avoid shortages? Make painless changes to BOM composition and costing? If yes, we want to introduce you to AutoSimply Manufacturing Software. 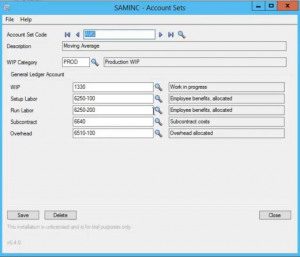 As a relatively low-cost Sage 300 add-on, AutoSimply Manufacturing software promises to help you get rid of the disconnect you are experiencing between your production floor, warehouse and cost accounting processes. Over the next few weeks, check back on our blog to get a detailed overview of AutoSimply software, and how it will impact your business. Today, let’s start with setting up AutoSimply Manufacturing software. To get notified of future AutoSimply manufacturing software blog articles, please subscribe to our blog today. In Inventory Control, when you navigate to the Inventory List in a sample company, you will notice that additional items have been added to the sample data inventory list (e.g. Item Numbers starting with SF, SE, SI, RM). Once you have an item number setup (incl. all the units, taxes and optional fields associated with that item) in the Sage 300 Inventory Control module, it becomes available in AutoSimply Manufacturing. Please note: Since AutoSimply is a Sage 300 add-on solution, it utilizes Sage 300 Inventory control. AutoSimply manufacturing also directly utilizes the Sage 300 Inventory Control locations and the type of costing at those locations. In Sage 300, Inventory Costs can also be held in a variety of different formats (LIFO, FIFO, Moving Average, Serial and Lot). AutoSimply Manufacturing normalizes all those costs to standard costs. Account Sets: When you navigate to AutoSimply manufacturing, and click on Manufacturing setup, you will see a setup option called Account Sets. These sets are exactly like the Account Sets in Sage 300 Inventory Control. An. e.g. of an Account Set in AutoSimply would be Moving Average. As you know, there are several G/L accounts attached to this Account Set. AutoSimply Manufacturing software allows you to attach manufacturing specific accounts to the Sage 300 Inventory Control Account Sets (e.g. you can add WIP, Setup Labor, Run Labor, Subcontract and Overhead to the Moving Average Account Set). Similarly, Category Codes allow you to add Manufacturing specific GL accounts (such as Internal Usage) to the existing distribution set. Production Areas: Production areas are used to store or process parts. Some examples of Production areas include an internal production area or a subcontractors’ production area. With AutoSimply Manufacturing, you can setup your production floor as you see fit, without any limitations. All transactions in AutoSimply Manufacturing are triggered against production areas, which can be used for reporting and analysis purposes. Work Center: It is essential to have at least one work center. This setup feature allows you to outline the steps that you are currently doing to build a product. Operations: This setup feature allows you identify tool usage. E.g. If you create electric drills and want to monitor their usage. Resources: This feature allows you to add labor events and other non-inventory events to Bill of Materials. Setup Information (Please note): It is essential to have at least one Production Area, Work Center, Operation and Resource to avoid system errors being generated. In the next blog article, we will take a closer look at how Manufacturing Orders and Bills of Materials work in AutoSimply. What did you think of this introductory article to AutoSimply manufacturing software? Let us know in the comments below. What else would like to learn about AutoSimply manufacturing software? To talk to an AutoSimply manufacturing software expert, please contact Front Line Systems at 866-435-0243.